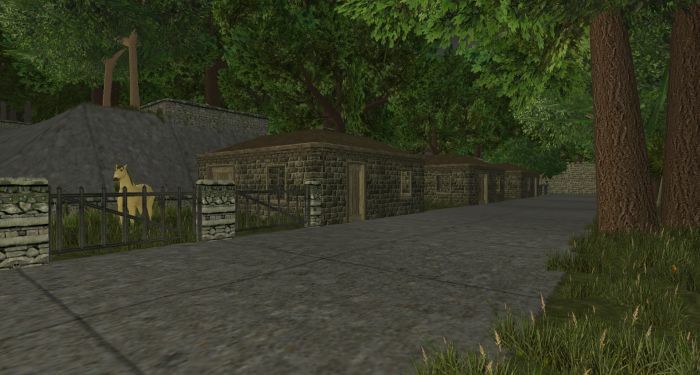 Renovations To Thorin’s Bay #WurmOnline – Nomadic Gamers, eh! Thorin’s Bay is located on the South Coast of Deliverance, and has been where I’ve been spending most of my in-game time. It’s a beautiful deed, but I’ve still found lots of little changes I’ve wanted to do to make it represent ‘me’ a bit more. One of the first things that was done was ripping out some of the horse pens and adding guest houses as well as an extra storage house. There are still some pens, but not nearly as many as there were before. Moumix also added an amazing reed farm to the deed along the dock area, so I’m now growing reed in addition to my corn fields. One of the larger houses has been given double doors along with indoor walls, separating rooms and creating a hallway. I’ve attempted to make a path of love section with a 3×3 area of flowers on the lower dock, but so far have been unsuccessful at it. For now I take my path of love characters over to Darkpaw to use the tile there. I’ve also tried creating a path of knowledge tile on the sand just outside of my perimeter, but haven’t had any luck with that (again I take Stargrace over to Darkpaw to use the knowledge tile there too). I’ve also removed a few of the slabs from the upper level and planted some flowers, and created a few statues and added some flags and banners to the area. The fountain was added along with a bench or two and some practice dolls for fighting skills. Over all, it’s coming along. Moumix was kind enough to map out the entire deed as well as a lot of the mine, which has been a huge blessing because now I know what nodes are where. I reached 50 mining, which means I can finally give up mining rock and move on to something else. Not that I mind rock, but I’ve done a LOT of rock mining during my stay in Wurm Online so far. I’m really excited to see what comes next. Moumix has been working on creating some boats (I believe his current is a corbita) to sell, and we’re slowly working through the bulk storage bins we have filled with logs. Very slowly, might I add. There are still thousands.